He is not afraid to speak his mind nor take sides on the cause he staunchly believes in. His music and his controversial statements both grab the headlines and garner avid fans and ardent supports. He's always been known to 'stick it to the man', so to speak. Even after four decades, there seem to be no signs of slowing down and backing down for the larger than life energy of Ted Nugent. 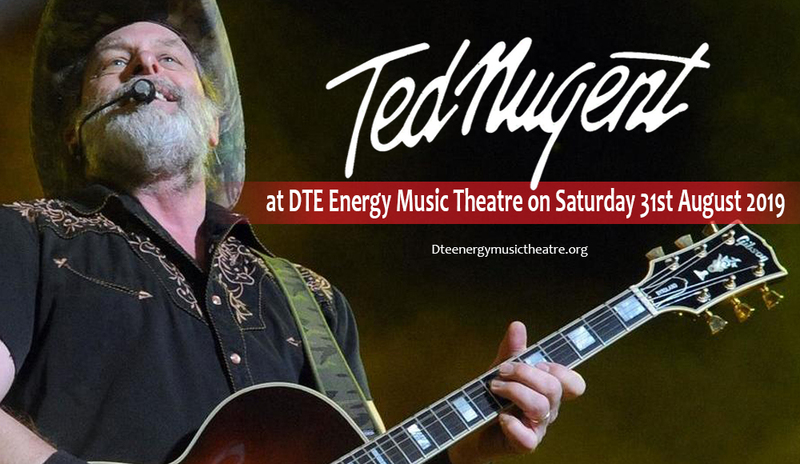 Ted is back on the concert trail to bring his powerhouse performance at the DTE Energy Music Theatre on Saturday 31st August 2019. Controversy aside, Ted Nugent has a big audience draw, capable of selling out arenas and concert stadiums. Don't take the chances; book your tickets a.s.a.p. and catch Ted Nugent's unstoppable concert show! Ted Nugent has worn and continues to wear many hats. He was once lead guitarist of the psychedelic rock group the Amboy Dukes, joined the supergroup Damn Yankees, and embarked on a longstanding solo career. He is a singer-songwriter and a staunch political activist. Above all these, is his musical prowess that has elevated him to legendary, iconic status. Indeed, Ted Nugent is that kind of artists whom we could say as unafraid to 'stick it to the man'. Despite the controversies that he has gotten himself into, he delivers the music with much gusto, and fans love him for it. With over four decades of rocking stadiums and concert halls, Ted Nugent show no signs of slowing down. He is back on the road, with current tour covering 13 cities features master musicians like himself — Greg Smith (BILLY JOEL, ALICE COOPER, RITCHIE BLACKMORE'S RAINBOW) on bass, Jason Hartless (JOE LYNN TURNER, MITCH RYDER) on drums, and the Motor City Madman himself on lead guitar and vocals. "Celebrating the soundtrack to the American Dream in 2019 — 60 years later — is more fun, stimulating, exciting and gratifying now than ever before. With master groovemonsters Greg Smith and Jason Hartless at my side, the music makes us do it like animals every night, every gig, every song, every lick. I got your BigFunDirtyGrooveNoize right here America! ", Nugent enthuses. You never know what you're gonna get…that's just the way it is on every Ted Nugent show. Go, get your tickets now!